On March 29th, 2008 people in more than 50 locations participated in this World Wide Event Sketchcrawl. It was raining on Friday, and like many I said to myself rain or shine I am participating. The meeting place was Ghirardelli Plaza in San Francisco, California. 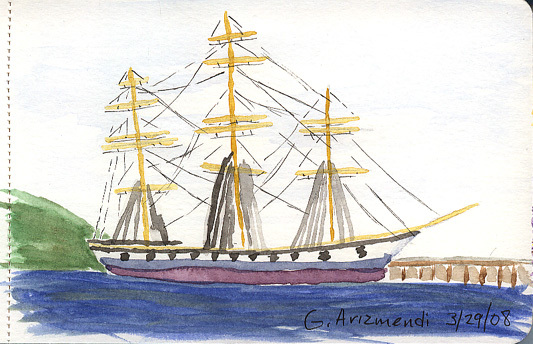 What a great location, great views, nearby beach, dock and antique ships and also great place for a chocoholic like me. 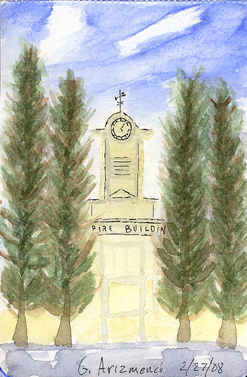 Below are the sketches of the day, along with a couple of watercolors. It was a challenge to get the colors I wanted, nonetheless It was a great experience – even if it was a little cold and windy at times. The challenge for me was the mixing of the colors and the water not looking like I wanted it to look, I also realized the first cables I painted were too thick, so I switched to a micron pen to do the rest. Overall it is an improvement over my previous watercolors and I am happy with the result. The challenge for this one was the angle. the dock (should I include it or not) and the reflection on the water. I was afraid at first to attempt the sketch because of the angle, so what I did was to create a thumb-sketch to get an idea of how to handle the issue, after that I first sketched the larger tugboat on pencil and then used a micron pen 02 (waterproof) to go over the pencil lines, lastly to colorize the boat. I had fun doing this watercolor, It was such a pleasant portion of the day (not windy and sort of warm) it seemed that all the views were so refreshing upon finishing this, It felt like I had reached some stage of stillness or something similar, the colors seemed so vivid, and I felt so good. In all a very rewarding day. This time I got the chance to stay until the end of the day and participate in the exchange of the sketchbooks. Ronnie del Carmen got it right when he mentioned on Sketchcrawl’s forum that the sharing of work can be a little intimidating, it was but eventually it wasn’t so bad. The funny thing is that I heard people express the same fears I had, and heard many explain why X looked this way or why Y looked that way (as I also heard myself saying). A couple of times I encounter a situation where it appeared the person liked mine better than theirs (or maybe i just thought that lol) and I felt that their approach was better than mine. I also heard people say that they were afraid of sharing at the end of the day and that may have been a reason why they left early. I overheard someone else mention that their friends were afraid of participating at all (because they felt their work may not be good enough). The lessons as I see them for me and I presume are for others too, are to let go of the fear of not getting it right, because the more you do the task the better you will get at it. 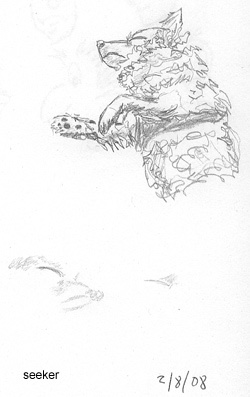 I think the reason why it may take some of us longer to improve faster is simply because we are afraid of ‘playing’ with the medium and see what accidents might occur, and the fear of sharing both at the end of the day (in Sketchcrawl context) as well as when we are in the process of creating something and someone steals a peek. 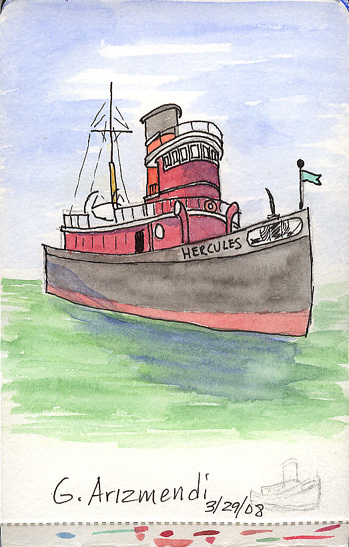 I actually used to try to turn my sketchbook away when I thought someone was looking and when I was working on the tugboat a person stopped to look and much to my surprise I stopped and actually showed it to the person, who responded “muy bueno” – yeah, it felt good! This past Saturday I went with my wife to a demonstration of Atelier Interactive Acrylics at a local art store. While she is currently using acrylics, I have never used acrylics, so I was intrigued about this new type of acrylic paint, and acrylics in general. I had fun playing with this medium because it is like painting with watercolors but in a way it’s better. With watercolor (and maybe it will change once I have more experience) one has to be very careful about how to layer color otherwise it turns into mud. With regular acrylics you can paint on top of it if you make a mistake but apparently they dry too fast. The cool thing about this medium (Interactive Acrylics) is that you can mix it with water, work on your painting and later on when it dries apply another layer on top of it, or use water or some unlocking liquid and continue mixing the paint as if it had never dried. Below are my two trials with this medium. Left Image Atelier Interactive Acrylics on canvas / Right Image – Atelier Interactive Acrylics on watercolor paper. At the end of the class they had a drawing… I won the grand prize, this is great I can’t wait to try this medium again. Below is a picture of the materials I won. A closer representation of our dog while he was napping. 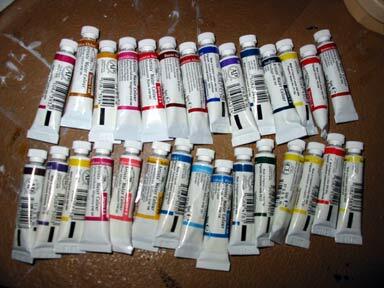 I couple of days ago I was fortunate enough to come across and purchase 32 5ml Winsor & Newton – Artist Watercolors tubes. Every book I have come across that teaches the medium suggests using the artist grade as opposed to the student grade. I have followed various tutorials out there and have noticed that my mixes do not look the same, It occurred to me that it may be due to them using artist grade and me using student grade watercolors (I also need to learn more). Below is a picture of the set (minus three that I gave to my wife). I can’t wait to start using them. I have been learning how to add some color to my sketches on the go. Using the portable kit I purchased a while ago. Below is the latest development.